Shelly this is beautiful - love all the subtle texture in the background - love white on white. Beautiful card. Love your colors and a great combo of dies. Gorgeous!!! 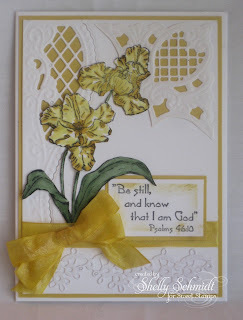 Love those colors you used on this elegant card! So pretty. This is so intricate and beautiful, Shelly! what a lovely card! thanks for visiting! Gorgeous card Shelly. Love those lacy die cuts! OMGoodness Shelly, this is beautiful. So elegant with the cut out die and gorgeous image. Really, really nice!